A conceptual rendering of the new Civil Engineering Research and Education Center. FAYETTEVILLE, Ark. – The Arkansas Department of Transportation made a $1 million investment in a Civil Engineering Research and Education Center at the University of Arkansas to support the creation of a facility that will benefit students, researchers and companies across Arkansas. 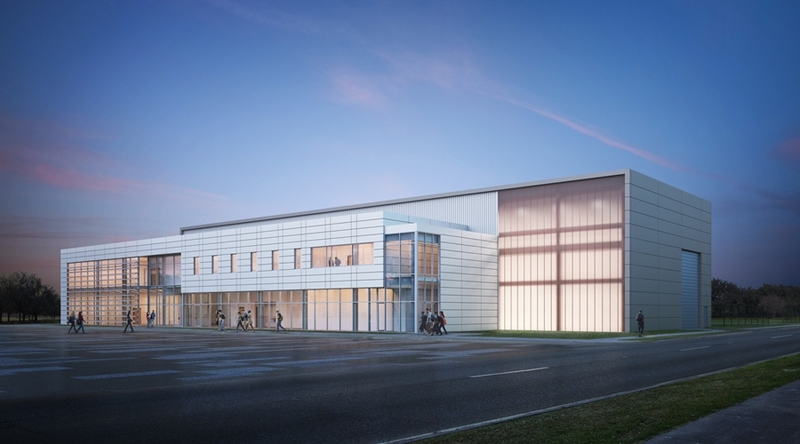 The Civil Engineering Research and Education Center will be located in the Engineering Research Center at the Arkansas Research and Technology Park in Fayetteville, and will be a “living laboratory” for civil engineering undergraduates at the university – the first of its kind in the state. Students will use the center’s design and construction process to explore topics in construction techniques and management; computer-aided design and drafting; plan development; construction materials; soil mechanics and foundation design; structural steel design and reinforced concrete design. The Civil Engineering Research and Education Center will also provide students with vital opportunities for hands-on experience through laboratory exercises and research activities and will truly be a statewide resource. Scott Bennett, director of the Arkansas Department of Transportation, is a graduate of the U of A College of Engineering and holds bachelor’s and master’s degrees in civil engineering. He is a member of the Arkansas Alumni Association and the Arkansas Academy of Civil Engineering.